Finding gluten free makeup brands are most likely essential now that you are transitioning into the gluten free world. Simple. Because your skin is the largest organ in your body and the absorption of anything that has gluten in it can be the difference between whether you are just mediocre in health or optimum in health. Never had to consider that, did you? Neither did I. Having to change absolutely every aspect of your life to help you be at your optimum health can be a real challenge. But don’t worry! You have help! The gluten free world is now complete with exceptional gluten free cosmetic companies and makeup brands. The highest qualities of standards have been developed to help you look and feel your best. It will make getting rid of your L’Oreal or Maybelline products that much easier. *Don’t be fooled. 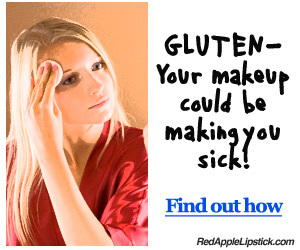 Higher quality products like MAC and NARS contain gluten as well. So this isn’t about price as much as it is about the ingredients therein. A whole new world has been open to you…Woo Hoo! 1) Does your face feel swollen or sensitive to the touch, especially when your foundation is on? 2) When you put on your eye makeup, do your eyes feel itchy, start to water, feel swollen or a combo of the three? 3) Do you feel generally exhausted, down in the dumps or feel stomach cramps (or any other gluten intolerance like systems) a little while after your makeup is properly primped and put on? If so, YOU HAVE BEEN GLUTEN-ED! It is time for a change. Below are some pages of gluten free makeup brands that I highly recommend. Within these pages, you will find out a little about each brand that makes it a great option. Enjoy your journey and may you find the gluten free makeup that is just right for you!